An asteroid passing through our solar system appeared to flyacross a star-forming nebula about 12,000 light-years away from Earth in a newinfrared snapshot taken by a NASA space telescope. The relative nearby asteroid, called 1719 Jens, just happened to be flyingthrough space at the same NASA's Wide-field Infrared Survey Explorer (WISE) wasstudying the much more distant Tadpole nebula in the Auriga constellation. And like anyinterloper blocking a photographer's view, the asteroid popped up in the WISEobservatory images. In the asteroid photo, the space rock 1719 Jens appears as aseries of yellow-green blobs peppering the otherwise colorful Tadpole nebula. Asecond asteroid even makes an appearance, which NASA highlighted in a box inthe new photo. WISE was also able to use its infrared eye to spy two satellitesthat fly in orbits above its own (highlighted in the ovals in the photo). Thesatellites appear to streak through the frame, appearing as faint green trailsin the busy image. The apparent motion of asteroidsis slower than satellites because asteroids are much more distant, so insteadof appearing as streaks in a single frame, the asteroids appear as dots thatmove from one WISE frame to the next. The site of all the action, the Tadpole region, is full ofstars as young as only a million years old ? relative infants in stellar terms? and has a mass of more than 10 times that of our sun. The Tadpolenebula got its name because the masses of hot, young stars are blasting outultraviolet radiation that has etched the gas into two tadpole-shaped pillars,known as Sim 129 and Sim 130. These "tadpole" structures appear as the yellowsquiggles near the center of the frame. The knotted regions at their headsprobably contain new, young stars. 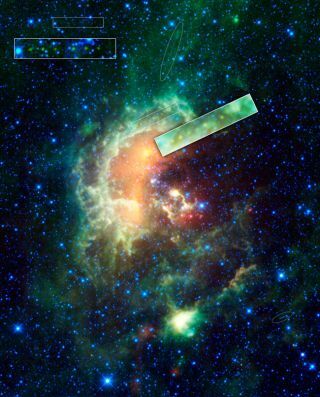 WISE's infrared vision will help to unveilthese types of hidden stars. Asteroid 1719 Jens was discovered in 1950, and orbits in themain asteroid belt between Mars and Jupiter. It is about 12 miles (19 km) wideand completes one full rotation every 5.9 hours. The space rock orbits the sunevery 4.3 years. The new WISE image is a composite of twenty-five frames ofthe region, taken at all four of the wavelengths detected by WISE. The spacetelescope caught 1719 Jens in 11 successive frames. Infrared light of 3.4 microns is color-coded blue:4.6-micron light is cyan; 12-micron light is green; and 22-micron light is red. ?NASA launched the $320 million WISE observatory in December2009 on a nine-month mission. The space telescope surveys the entire sky,snapping pictures of everything from asteroids to stars to powerful, distantgalaxies. While some WISE mission scientists lobbied for a three-monthlife extension, a NASA panel is currently recommending not lengthening theobservatory's mission.